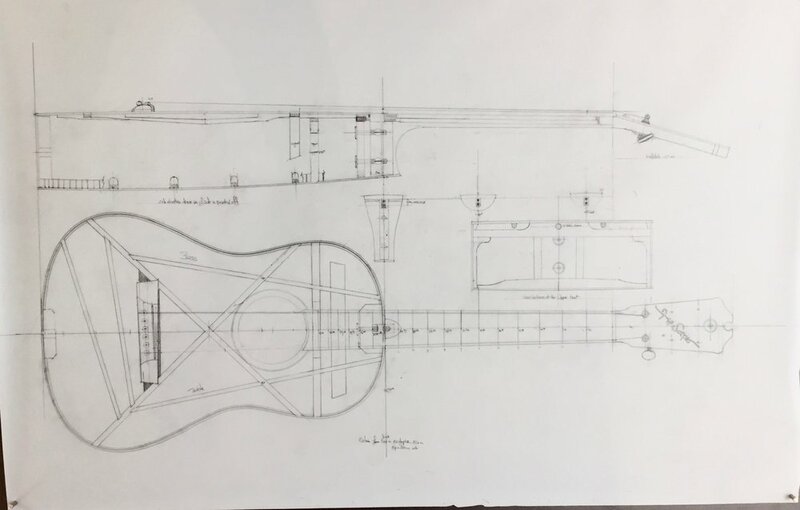 The Dedee Shattuck Gallery is pleased to present Flip Scipio: Talking Guitars, featuring the drawings and guitars of internationally renowned luthier Flip Scipio. Raised in post-war Netherlands and now based in New York City, Scipio has made and restored fretted instruments for Jackson Browne, Bob Dylan, Paul Simon, David Bowie, Paul McCartney, Bruce Springsteen, Ry Cooder, Chris Eldridge, Bill Frisell, Richie Havens, Norah Jones, Patty Larkin, Damien Rice, Carly Simon, Rufus Wainwright, and many others. As Scipio writes of his work, music is “that common language that allows people all across the world to communicate or at least understand each other without receiving specific instruction... my workshop is my church, in which I find a relief in concentration that I often lack in the outside world, solace in being able to repair broken things, and a kind of forgiveness for the things I don’t seem to be able to achieve. Hired by the esteemed American guitar dealer and collector George Gruhn, Scipio was a staff member of the repair department at the Rhode Island based Guild Guitar Company from 1986 until 1988. He was also the repair-shop manager for Mandolin Brothers Ltd., the legendary Staten Island NY guitar shop that specialized in rare fretted instruments. In January of 2017 Scipio gave a series of lectures on various aspects of Guitar Construction and Repair at the prestigious Cartagena XI Festival Internacional de Música in Cartagena, Colombia. The Dedee Shattuck Gallery invites the public to an artists' reception to celebrate the opening on Saturday, September 8, from 5-7pm, including a concert by Flip Scipio at 6pm. Flip Scipio is a Manhattan based Luthier who builds and restores guitars and related fretted instruments. A 1984 Graduate of the prestigious London College of Furniture, he holds a degree in Modern Fretted Instrument Technology. Hired by the esteemed American guitar dealer and collector George Gruhn, Flip was a staff member of the repair department at the Rhode Island based Guild Guitar Company from 1986 until 1988. He was also the repair-shop manager for Mandolin Brothers Ltd., the legendary Staten Island NY guitar shop that specialized in rare and desirable fretted instruments. It was a privileged position he held for seven years. Flip Scipio has been in private practice since 1996 in shops located at various locations around New York City. During this time he has created and repaired fretted instruments for various artists such as Jackson Browne, George Benson, David Bowie, Edie Brickell, Jeff Bridges, Jonatha Brooke, Larry Campbell, Jim Campilongo, Steve Cardenas, Rosanne Cash, Jenn Chapin, Marc Cohn, Shawn Colvin, Ry Cooder, Wes Craven, Stefan Crump, Rick Danko, Tom DiCillo, Bob Dylan, Chris Eldridge, Bill Frisell, Robbie Fulks, Tony Garnier, Richie Havens, Mary Halvorson, Shahzad Ismaily, Norah Jones, Patty Larkin, Will Lee, Adrian Legg, Gerry Leonard, John Leventhal, Javier Mas, Paul McCartney, John McEnroe, Ben Monder, Joan Osborne, John Pattitucci, Noam Pikelny, Marc Ribot, Damien Rice, Adam Rogers, Brandon Ross, Anton Sanko, Erik Sanko, Duncan Sheik, Carly Simon, Paul Simon, Martin Simpson, Slash, Bruce Springsteen, Leni Stern, Stephen Stills, Ben Taylor, Livingston Taylor, Kate Taylor, David Tronzo, Suzanne Vega, Tony Visconti and Rufus Wainwright. Flip Scipio is the subject of the 2007 Documentary “Talking Guitars” by the Dutch filmmaker Claire Pijman, which premiered at the renown International Documentary Festival in Amsterdam, Holland and went on to be a feature in the 2007 HotDocs festival in Toronto Canada, and has been aired on the Dutch and American television. (www.talkingguitars.nl ) He was profiled in the Wall Street Journal (04/10/2011). In May and June of 2015 The Talking Guitars documentary has been a featured item on KLM Royal Dutch Airlines long distance flights. In January of 2017 Flip gave a series of lectures on various aspects of Guitar Construction and Repair at the prestigious Cartagena XI Festival Internacional de Música in Cartagena, Colombia. At present Flip Scipio shares a workshop in the Bushwick neighborhood of Brooklyn NY with his wife, the bookbinder Mitzi Pratt. It always has been about music for me, that common language that allows people all across the world to communicate or at least understand each other without receiving specific instruction. 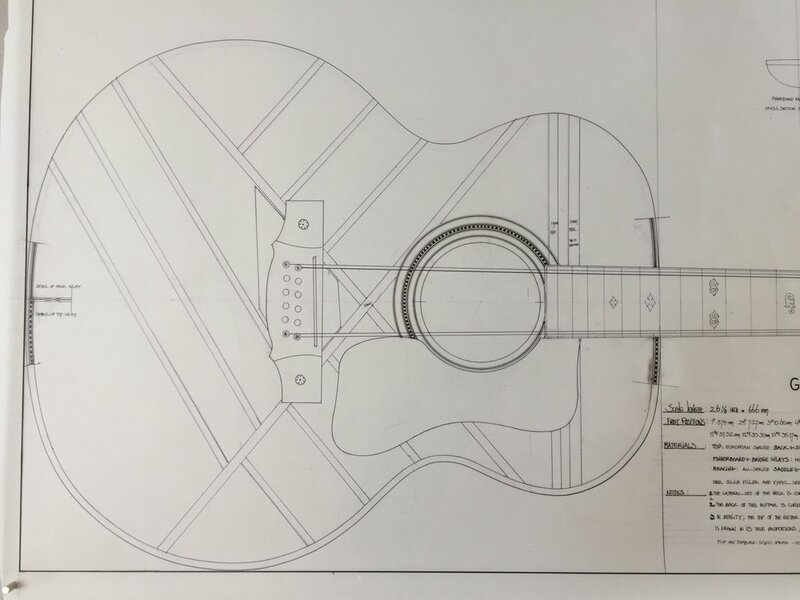 The circular aspect of being someone who repairs guitars as well as builds them has served an interesting purpose in the sense that in my role as a guitar fixer, I get to see other ways than my own in which to design a musical instrument or solve a particular problem. Whereas guitar makers can be free to shape anything the way they see it, being a repair person requires an innate ability to correct somebody else’s work without inserting ones own personality. Some of the most intensely difficult and demanding repair work I’ve done required total anonymity. Considering that I was raised in post-war Netherlands without any religion of any sorts, my workshop is my church, in which I find a relief in concentration that I often lack in the outside world, solace in being able to repair broken things, and a kind of forgiveness for the things I don’t seem to be able to achieve. At best, my shop is a place of meditation where I can find moments of transcendence into a place of better understanding and trust without having to close something else out. Other days it is a place where the tools of the trade get repaired, modified and revitalized. I rarely seem to just “fix things”, the guitars usually leave the shop noticeably improved. Coming from somebody who early on noticed an unfortunate ability and tendency to copy other people’s art work, what I do has always been about finding my own voice, and although I’m quite aware that I can’t hear it all the time, other people seem to recognize it better than I do . I’m only as good as my next job. This is the first guitar I ever made. 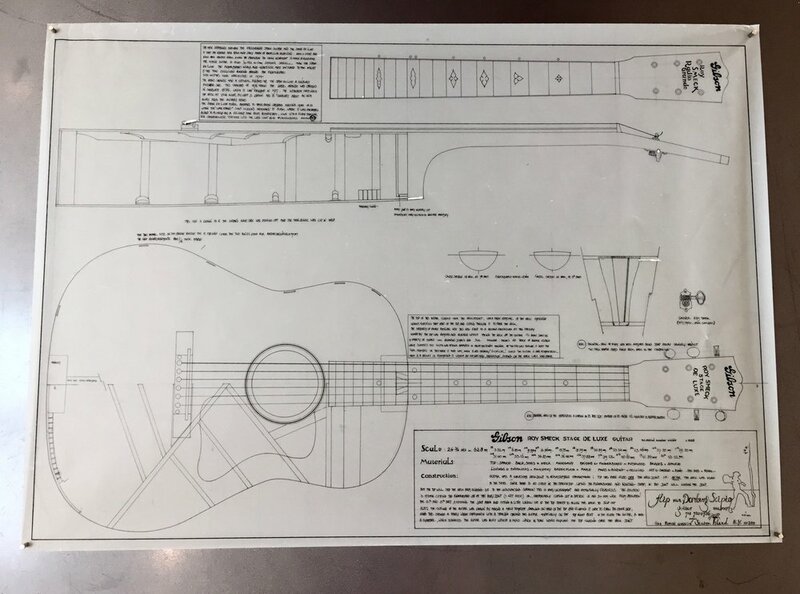 The bridge design came from an eccentric looking guitar John Renbourn was pictured with in the transcription book of his tunes that I was playing out of during that time. 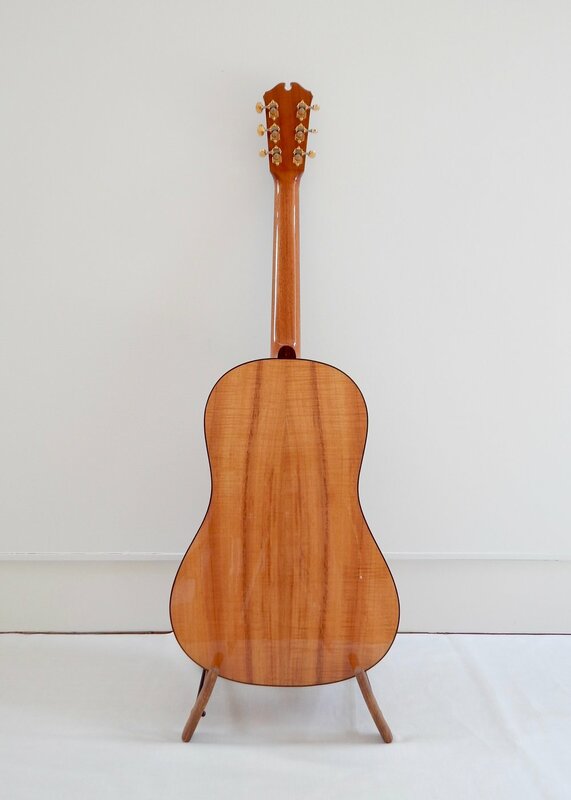 The guitar's distinctive silhouette pegs it for what it is: a Božo student model. Božo Podunavac was a Serbian luthier who taught a guitar making class out of his store on University Ave. in the late 1970’s. Spruce, Rosewood, Mahogany, Ebony, Maple, Abalone and Mother of Pearl. This Baritone Guitar was commissioned by the New York based Composer, Singer and Guitarist Leni Stern in 1997. 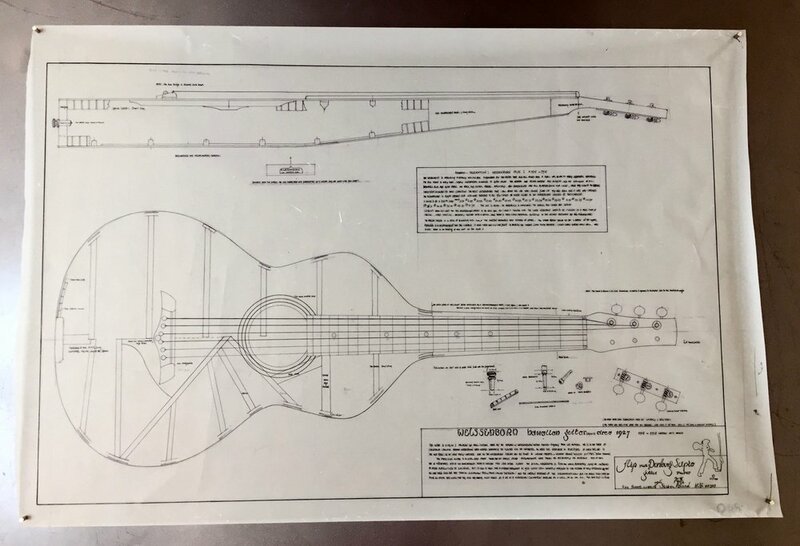 It took a number of years to complete, not only because of my dual obligations as a repairman, but also because the guitar’s intended scale length changed during the time the guitar was under construction. Originally designed as an instrument that would be tuned down to A-D-G-C-E-A , it ended up being tuned to C-F-Bb-Eb-G-C. With a shorter scale length, it allows for a much more relaxed playing position. The abalone and pearl inlay on the headstock is a facsimile of a tattoo. When Jackson Browne drew my attention to the largest cousin of the Spanish Bandurria family in 2005, it was the first time I had ever heard of it. Mr. Browne had mentioned his friend Javier Mas, a versatile stringed instrument player from Barcelona. Mr. Mas had recently come into the spotlight due to his masterful accompaniment of Leonard Cohen’s now legendary last series of concerts, during which Javier was heavily featured playing the Archilaúd. Mr. Browne was interested in having an Archilaúd, but at that point in time the Spanish maker of Mr. Mas’s instruments had retired and the arcane 12 stringed instrument seemed almost extinct. Before a concert Mr. Mas gave in Providence, RI, he was kind and generous enough to allow me to inspect his instrument. I made notes of it’s interior from what I could see with an inspection light and a mirror. The blue print I subsequently drew up is displayed here with the Archilaúd I finished in 2006. The body silhouette realls the Arabic Oud in a fashion, even though unlike the Oud The Archilaud has sides and a fairly flat back. It also has frets, which allows for a fixed pitch when playing, whereas the Oud, like the western violin and the Indian Sarod have a fingerboard without fixed pitches. As for the wood, the back and sides of this particular instrument is made from a piece of Yew, also known as Taxis wood, which is was the traditional material for English Long Bow making. I was puzzled about the provenance of this fairly uncommon wood, and I finally figured out I had purchased it in London in 1983, where I had attended the London College of Furniture, which meant that I had that set of wood for 23 years before I actually built something with it. It made me feel better about the dusty pile of wood I keep lugging around with me. Spruce, Cypress, Cedar, Ebony, Rosewood. The making of this traditionally Spanish Style classical guitar was both a dream come true and a coming full circle of sorts. 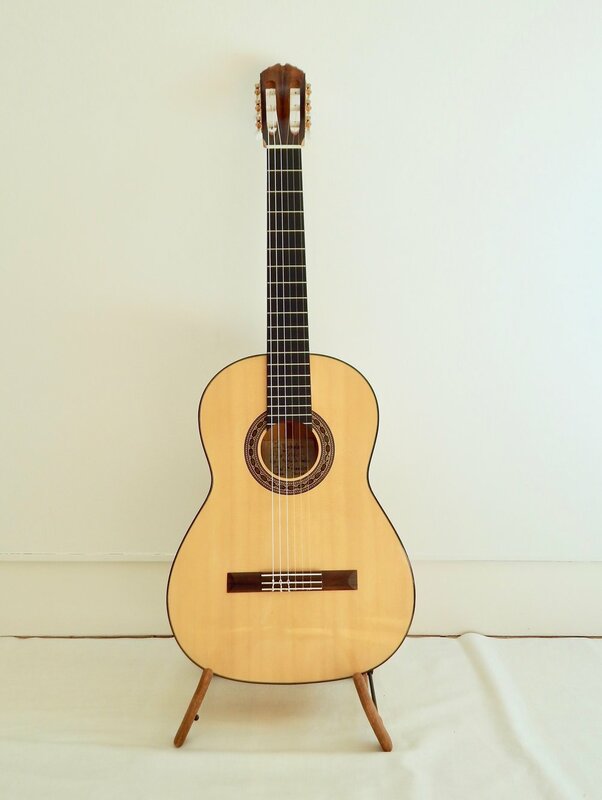 In the spring of 1979 I had gotten on a bus in Amsterdam in order to travel to Spain and gain an apprentice ship with the master luthier Paulino Bernabe. Maestro Bernabe had been the foreman in the famous Ramirez guitar shop in Madrid, but had become well known for his daring experiments amongst the traditionally conservative and generally taciturn Spanish guitar makers. 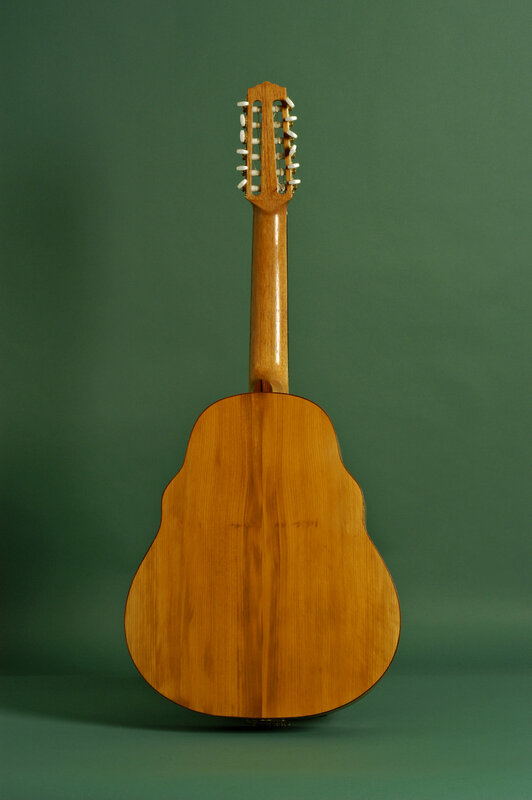 Although I had been promised an apprentice ship by somebody apparently close to Señor Bernabe, it became obvious that my dream to immerse myself in Spanish guitar culture was not to be. Nevertheless, Spanish guitars and Spain have always been a big part of my life. And on Christmas morning of 2011, I received notice from Maestro José Luis Romanillos that I was accepted in what turned out to be his last guitar making class in the town of Sigüenza, which also happened to be the name of one of my favorite classical guitar pieces that I’ve been playing over the years. Having had the opportunity to build this guitar with this incredibly talented, generous and gentle yet world famous master guitar maker connected me in a beautiful way with unanswered questions going back to 1979. This guitar, simply constructed of moderate but well aged materials, I compare to the espresso of my work. Shahzad Ismaily, besides being a noted composer, bassist and percussionist, also operates the Figure Eight Recording studio in Brooklyn. 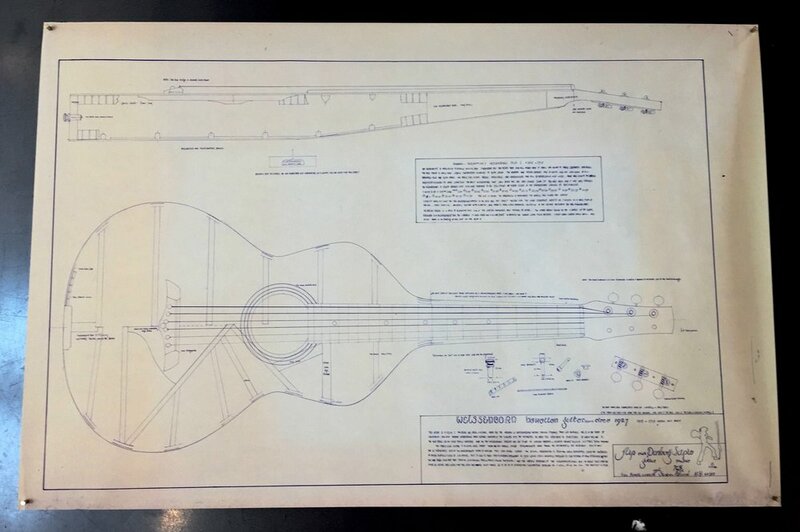 He had seen the drawing of a CF Martin made Ditson guitar, on display here, and was intrigued by its appearance and format. We decided on an updated version with a longer scale and stronger bracing than the 1917 guitar that inspired it. 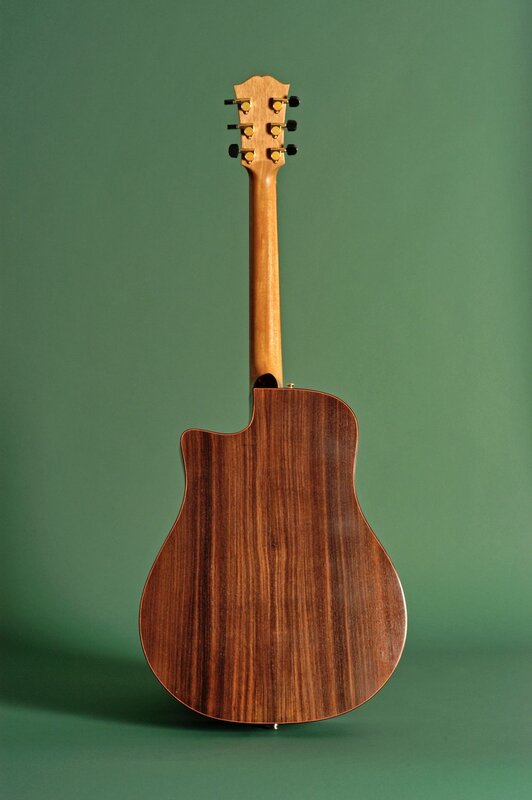 The name Klazina 17 came about looking at the rosewood used for the back and sides which reminded us of a cow hide. Dutch farmers tend to give all their cows one single name and a number, as in Betsy4, Betsy12 and so on. But we have a good friend named Betsy so I decided on the old fashioned Dutch name Klazina. The 17 refers to 1917, when the original Ditson was born in Nazareth PA. Spruce, Rosewood, Maple, Mahogany, Ebony. Abalone. 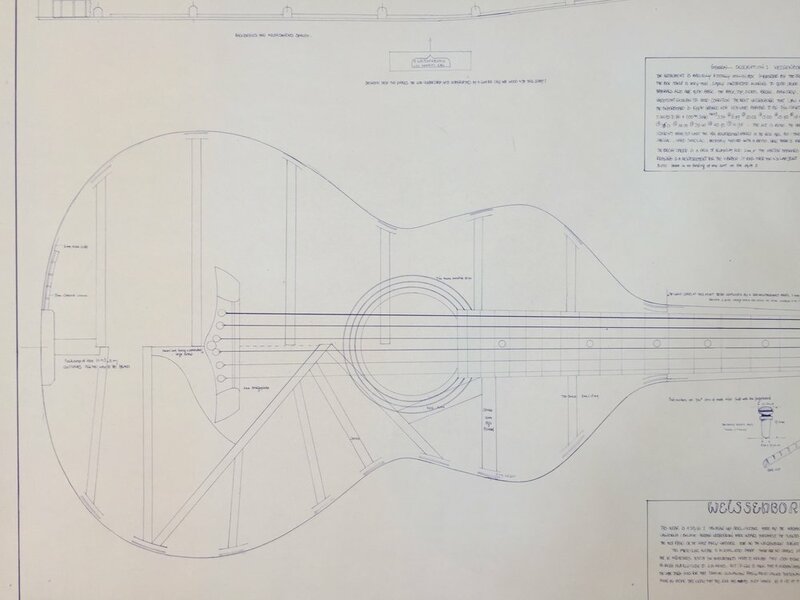 As a longtime admirer of luthier Michael Gurian’s 1970 era acoustic steel string guitar designs, I took the opportunity of Mr. Tarica’s commission to build a guitar without any limits on style and appearance. I wanted to make a guitar that at first glance looked like a Gurian guitar with its distinct classical guitar shape, but upon closer inspection turned out to be something completely different. I’ve always been intrigued by the concept of things that are not what they appear at first sight. I made two of these instruments simultaneously, something I very rarely do. The guitar on display is the one made for Larry Tarica and its brother was made for Jim D'Addario. To make the twin guitars as identical as possible I took the unusual step of taking the sides from one set of back and sides and switched it with the other set. Spruce, Koa, Mahogany, Ebony, Rosewood. This guitar is another example of an ongoing project to break out of the traditional bracing patterns of these types of steel string guitars. 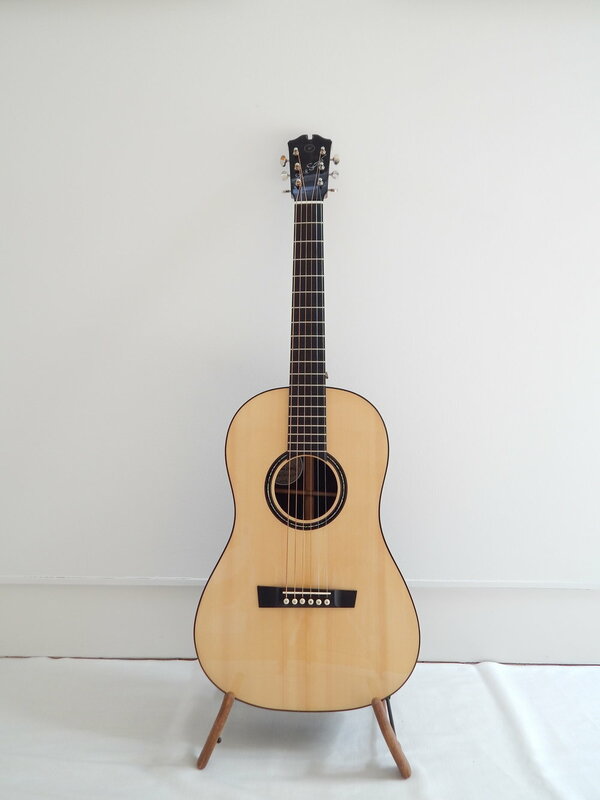 Even though the body style is patterned after a 1917 CF Martin made Ditson guitar, the internal construction reflects a more contemporary approach to guitar construction. All top braces are interlocked and unlike the traditional factory dovetail style glued-in mortise and tenon joint, the Philothei’s neck has a straight mortise and tenon joint that's attached with two bolts. The Hawaiian Koa wood comes from a Koa tree on Maui that got felled in a storm. This wood has been a longtime favorite of mine; it’s very difficult to work down to the required thickness, but the results are usually worth the busted knuckles and cuts in my fingers. This guitar model was the basis for the BigStrum series of guitars I made over the last few years: Although it’s more or less functioning as it was originally designed, this particular guitar has been modified: the neck has been reworked, the multi-function controls have been reduced to a simple master volume and master tone control and the tone numbing capacitor switch has been disconnected. The original bridge and tailpiece have been replaced with better sounding and working parts. The four single coil pickups have a beautiful transparent sound that is unique to these early Japanese pickups. I’ve been a serious fan of Ry Cooder’s music since hearing a 1977 live radio broadcast of Ry’s concert with the Chicken Skin Revue in Amsterdam’s famed and fabulous Concertgebouw. It came to my attention that Cooder was using a curiously modified Fender Stratocaster when playing bottleneck style. From an article in a magazine, I traced down the particular vintage pickups he had been using on his guitar since the late 1980’s and somehow cobbled up a guitar for myself that approximated the sound and feeling I got from hearing him play. When I finally got to meet Mr. Cooder, I showed him my copy of his instrument. He seemed amused and thought the guitar wasn’t half bad. He liked the finish—a type of crackled finish job that looked like it had been in a maraschino cherry factory fire—but he did point out wisely that even with the seemingly correct parts, lightning doesn’t strike twice, and that remarkably good things usually are a result of incalculable freak factors that cannot be repeated. Since then, I’ve made a handful of guitars that are now generally referred to as “Coodercasters” as a compliment to this great musician and guitarist. But, as is my wont, the guitars that originally started off as faithful copies of Cooder’s beloved Hop Up guitar soon morphed into something else—either influenced by the artist’s preference or just because it seemed like a good idea at the time. It’s all about what’s happening on my workbench at that particular moment. The five instruments on display all represent a detail in the line of thought that I occasionally delve back into. They are interesting to me because even though they were born out of the same concept, they all are being used in a different manner. Mandolin Brothers Shop. Staten Island. This was my first attempt to make a usable copy of Ry Cooder’s much lauded electric bottleneck guitar. Based on a Stratocaster style body, this guitar has a pickup from a 1960’s Japanese Teisco guitar and a pickup lifted from a 1950’s National Hawaiian Lapsteel guitar. The neck on the instrument was wide and the action was higher than usual to allow for playing slide guitar with a Bottleneck, which as the name implies, is a broken off neck from a wine bottle. I played the guitar for several years tuned to an open tuning until I realized I was playing nothing but diluted versions of music Mr. Cooder had already recorded. I subsequently converted the guitar to a baritone register and gave it to a friend that had a gig which required a baritone guitar. Several years ago the guitar came back to me. I changed the neck and installed a 1960’s DeArmond Synchromatic model 1000 pickup in the bridge position and made it into what it looks like now. It’s tuned down to B-E-A-D-F#-B. 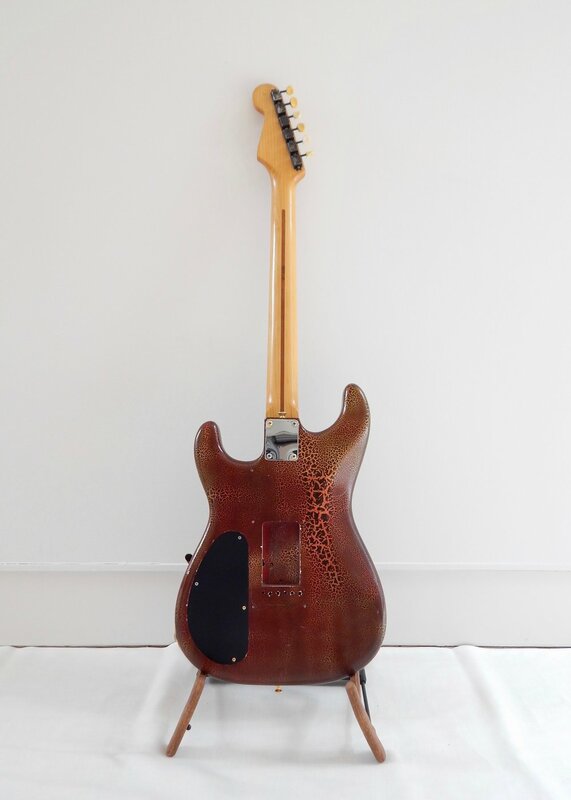 Having seen my version of Ry Cooder’s main bottleneck guitar, Jackson Browne commissioned me to make him a “Coodercaster” Mr. Browne supplied me with a Fender Stratocaster, from which I used the body and made a neck that would suit our purpose. Mr. Browne also supplied a Valco-made Supro lapsteel instrument from which I used the pickup. This is the last of the “Coodercaster" style guitars that I’ve built. What originally started as something akin to satisfying my curiosity, has now become a kind of cottage industry, with numerous people assembling copies of Mr. Cooder’s guitar, and several pickup companies making remarkably faithful copies of the somewhat arcane vintage pickups originally used in Mr.Cooder’s bottleneck guitar. Mike McMahon is one of the very few people I’ve encountered whose playing style embodies Cooder’s muscular guitar playing without actually copying it. 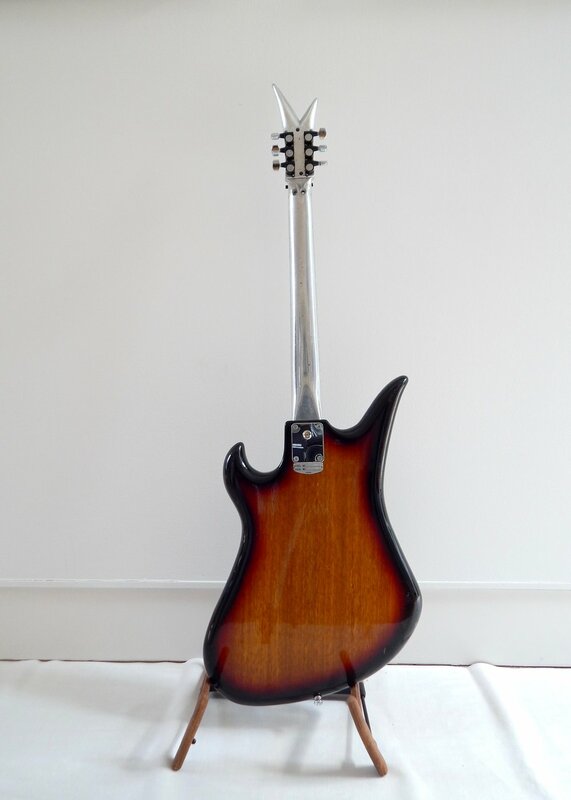 This hybrid electric guitar was a result of combining some of the elements of the Coodercaster with an instrument that would be a bit more flexible by omitting the somewhat cumbersome lap steel pickup with a smaller unit and a vibrato tailpiece. It got to be called a Flippercaster, a pun on the Dutch word for a pinball machine. This guitar was commissioned by the left handed guitarist Slim Simon. It’s another hybrid Coodercaster/Flippercaster, having the vibrato tailpiece in addition to the Japanese Teisco pickup and the lapsteel style back pickup. The blue Mother-of-Aquarium finish was applied by the very talented Steve Olson of Tonecone Guitars. This converted Harmony Solid Body Electric guitar grew out of a curiosity about the guiatone pickup, made in Japan in the late 1950s. I’ve made a number of these guitars with this single coil pick-up that, due to its curious construction, produces a unique transparent tone. 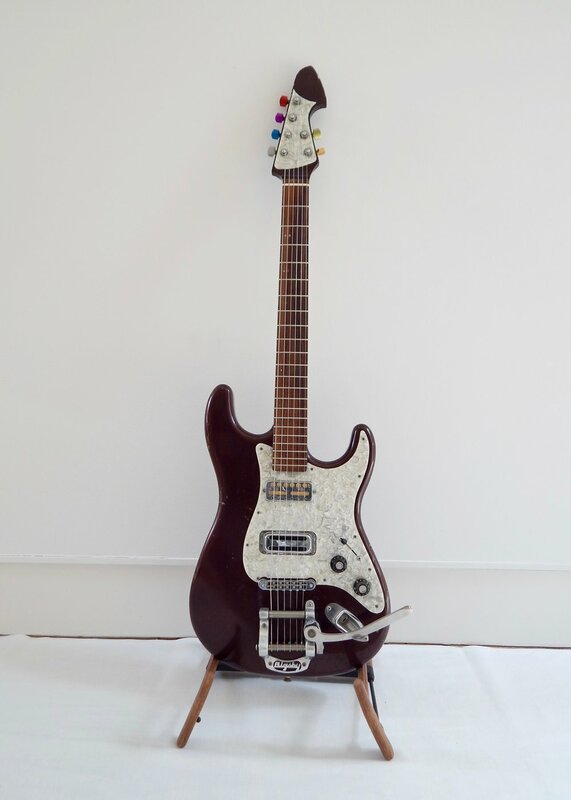 Commissioned by Paul Simon, this guitar was the second electric high string I made for him after he started recording with what was originally supposed to be a working model of a concept guitar I had assembled on his request. Mr. Simon was using an acoustic “high string” guitar for a number of years, simply a six string guitar on which the four lower wound strings are replaced with thin plain strings that are tuned up a whole octave from their original pitch. This way of tuning a guitar gives an effect somewhat like a 12 string guitar without the intonation problems often associated with the instrument. Since it had been a favorite tool of Mr. Simon’s, he suggested an electric version of a high string guitar. I came up with a prototype of sorts, without any finish or scratch plate, but with all the necessary details. That first rough guitar is visible on the images here. It has been in constant use since I showed it to Mr. Simon. After I came to the realization that this prototype was not going to return to my shop, I felt obliged to make him another guitar that reflected a more professional approach. Looking quite splendid in its electric eggplant finish and ebony cummerbund, it has just returned from a tour around the world as a backup to the sparsely dressed Number #1 electric high string guitar. The #1 Prototype was first featured on the cover of Mr. Simon’s 2001 “You’re The One” recording and has been in steady use ever since. Sometime in 2014, Robbie Lee, a Brooklyn based musician and record label owner, walked into my shop with a vaguely familiar metal object he referred to as his “scepter.” It turned out to be a solid aluminum guitar neck that was originally created in the early 1970’s by John Veleno, a Florida-based metal worker, who made a small number of highly regarded electric guitars machined entirely out of aluminum. Mr. Lee was curious whether I would be interested in creating an electric guitar with this extremely rare guitar part—one is more likely to encounter Mary Celeste’s First Mate in a pawn shop than a Veleno guitar neck. Mr. Lee salted his idea by adding another musical Sancy[BS1] : a handmade steel guitar pickup by Paul Bigsby, the legendary Californian pattern maker and father of the modern electric guitar as we know it today. Paul Bigsby made highly regarded electric and steel guitars that are amongst the most collectible instruments in popular music. I installed these extremely rare parts on a mid nineteen sixties Japanese guitar body called a Teisco Spectrum 4. Although it was the first inception of what was quickly nick named “BigStrum” by combining Bigsby with Spectrum, it did already have that certain ‘je ne sais quoi' that made it the interesting amalgam of styling and sound quality we were looking for. Once the Robbie Lee’s BigStrum guitar was completed in 2011, I made a few more of these somewhat arcane guitars, two with aluminum necks that were custom made for these instruments by the very talented Kevin Burkett of The Electrical Guitar Company, and were purchased by Jackson Browne. I also have had good results with refurbishing the original necks and adding custom made pickups. An original Teisco Spectrum 4 and the four BigStrum guitars on display here are interesting to me because they show the different ways this playful Japanese body design, itself a copy from earlier Rickenbacker and Mosrite guitars, can be used to recycle an otherwise often ignored guitar. This is the original BigStrum guitar, the name a word play on Bigsby and Spectrum. Made from an aluminum neck bolted to a heavily altered Teisco Spectrum 4 guitar body with an original 1950’s Aluminum cast Paul Bigsby steel guitar pickup and a mid 1960’s Gibson Thunderbird Bass pickup, this instrument came out sounding so well, with an unusually long sustaining sound, that several other guitars more or less like this one, have followed suit. This is a typical example of a successful collaboration between customer and maker, where the customer suggests specific parts to use and the maker figures out how to make it work in a musical way. 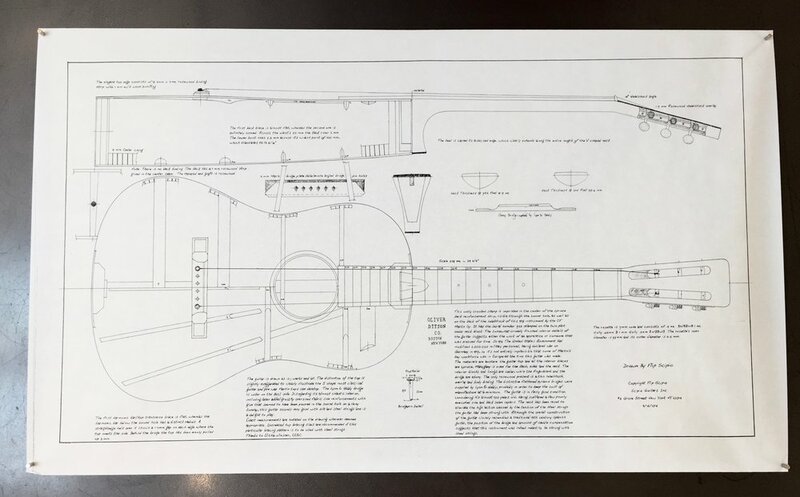 When I was asked by Mr. Browne to investigate the possibility of making a second BigStrum guitar the first hurdle was acquiring an original 1966 Teisco Spectrum guitar, but the second and larger hurdle was finding an aluminum neck, me not being a machinist. The original BigStrum, also here on display, was assembled with a very rare neck made by John Veleno that Robbie Lee found in a Florida Pawnshop—and lightning does not strike twice. Mr. Lee was kind enough to refer me to the amazing Kevin Burkett, a machinist that operates The Electrical Guitar Company in Pensacola FL. Kevin created two beautiful aluminum necks to the specifications I had requested, with matching Teisco style 4+2 tuners on the headstock. The pickups for this guitar were custom made by Fred Stuart and Jason Lollar. Due to the aluminum neck the instrument is out of balance and is usually played sitting down. Originally intended to be a test bed for a newly acquired Bigsby reproduction pickup by TK Smith, this guitar turned out notably well even though it was not assembled with an aluminum neck, like its three predecessors. 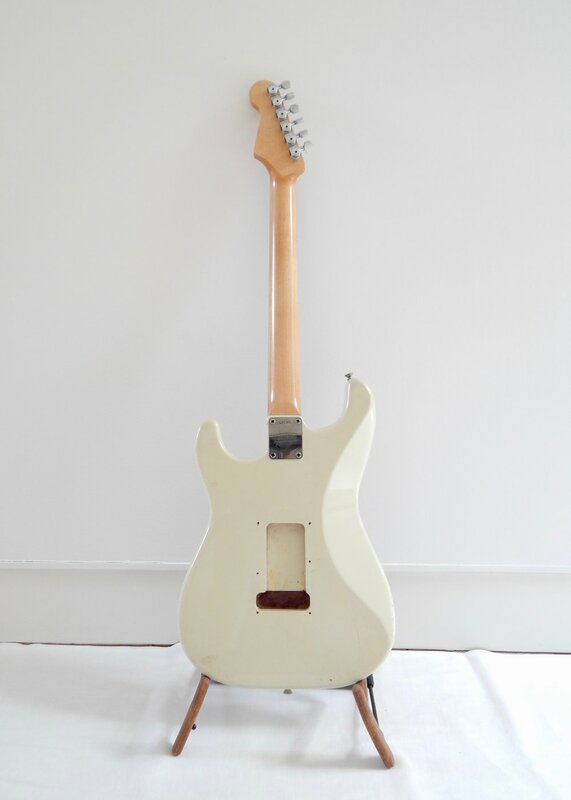 It had its original maple neck refurbished and was outfitted with the same hardware as BigStrums 1, 2 & 3, but due to the wooden neck has its own unique sound and response. The discolored head plate of this guitar is due to it have been stored for many years in Alaska where it must have been cold and damp. Commissioned by Composer, Guitarist and Head of the Department of Jazz Studies of SUNY New Paltz, Mark Dziuba, this BigStrum guitar was the first one that was specifically designed around the two Harmonic Design pickups that matched the unusually large celluloid “Mother of Toilet Seat” scratch plate. It also sports a modified Bigsby vibrato tail piece that was sunk into the body to achieve the correct balance between string down pressure on the bridge and freedom of movement when using the vibrato bar.